Model T Ford Forum: Ammeter reading ? 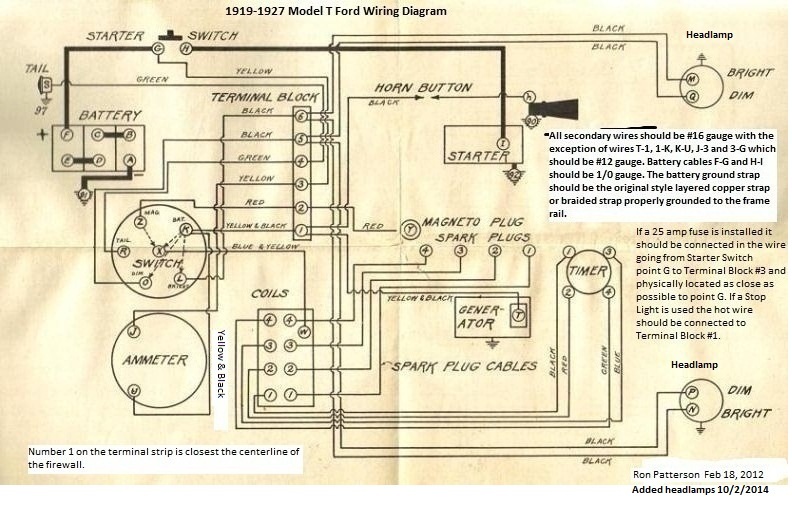 Model T Ford Forum: Forum 2014: Ammeter reading ? Starting my 26 tudor after a complete engine rebuild, new replacement wiring harness, generator rebuild, new ignition switch etc. Generator is putting out 12 amps, tested with a know-to-be good meter. The ammeter at the ignition switch initialy showed a discharge, however when the headlights are turned on the ammeter shows a discharge,...which as I understand is correct, indicating a draw on the electrical circuit. So when I reversed the wires at the ammeter, now the generator is charging 12 amps as it should, but when the lights are on the needle on the ammeter moves to the charge position. 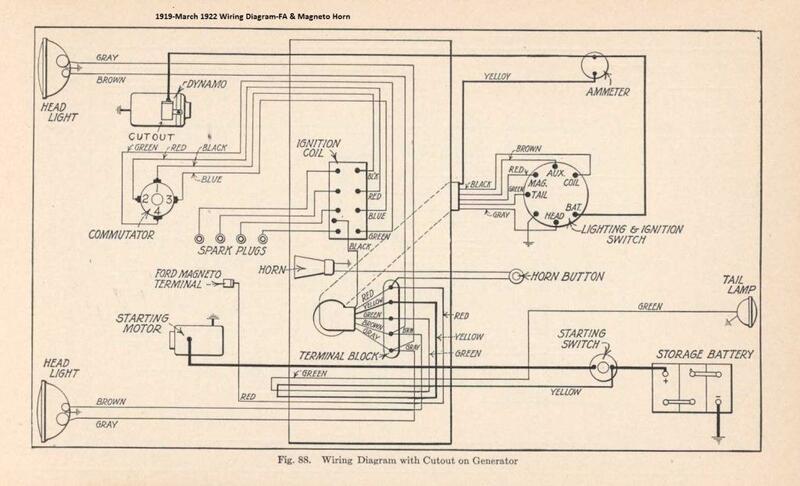 The wiring diagram I used the one issued by Lincoln publishing??? 12 amps is pretty high. 6v or 12v? Do you have a cutout or a VR? What meter? Are you checking at idle? Some of your statements are confusing. I think your cutout is stuck. At low speeds the generator output is less than the battery voltage so the cutout should be open. I think in your case the battery is driving the generator as a motor at low speed. When you speed the engine up, your ammeter should' move from discharge to charge. It's likely that the generator with the stuck cutout would run your battery down when the engine is not running. Anytime I hear these kind of indications, I insist upon conducting two simple tests to ensure the charge and discharge circuits are wired correctly. I have learned the hard way to not clarify this issue first is a mistake. The inference a car is not wired correctly annoys many people, but this area is commonly miss wired. To make matters worse many of the wiring diagrams floating around are flat wrong. 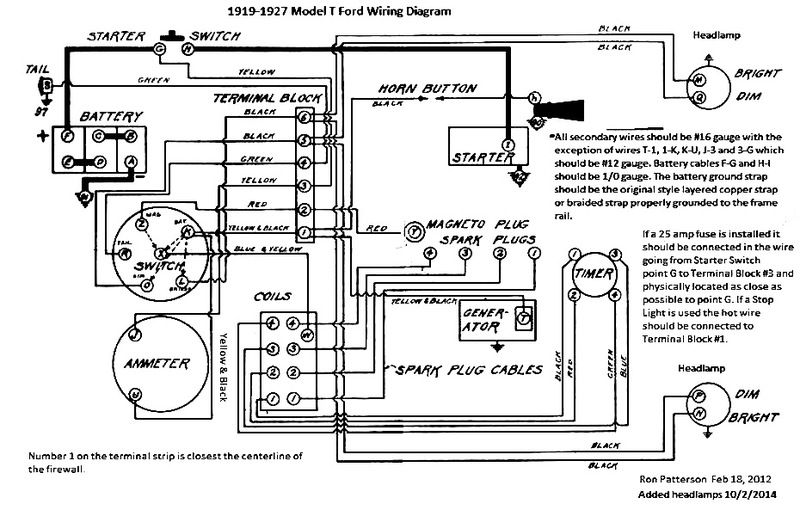 I will only work on Model T electrical problem with the diagram above because I know it is correct. Give me a call 10am-4pm est and I will walk you thorough these two simple tests so we can ensure the wiring is as indicated in the diagram above. Then we can fix the trouble. Here's the diagram without the paper. It has been pointed out to me that the diagram above is not entirely correct when it comes to the magneto and electric horns. 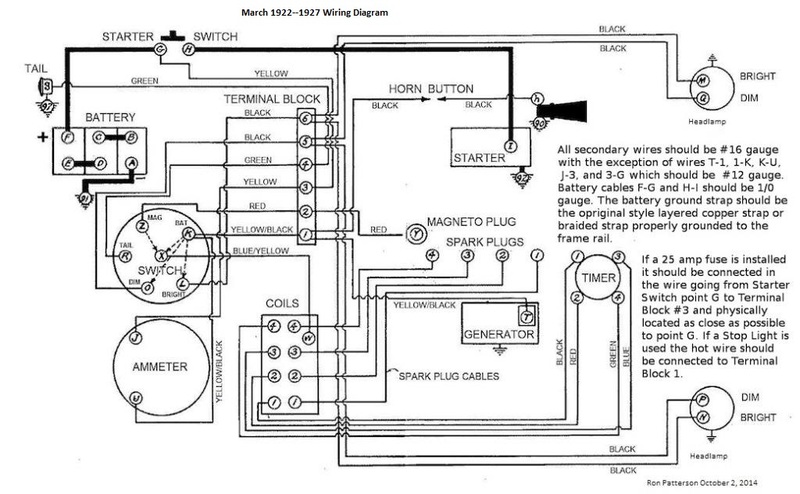 This following (corrected) wiring diagram is for March 1922 to 1927 only. Notice electric horn. The following wiring diagram is for 1919 to March 1922. For chassis with FA Electrical System and magneto horn. Is it the original ammeter ? So it is 90 years old with all the vibrations caused by a rolling car. In these ammeter there is a small magnet so that it shows discharge or charge with the direction of the current. This magnet as the magnets of the magneto can fail and the ammeter will show either charge or discharge with no reason. Best trying it alone with a battery and a bulb. I have several of these old ammeters that will always show charge.